This is the newest and largest mosque in Aberdeen, the ‘oil capital of Europe’. It received planning permission in September 2013. A new mosque on Aberdeen’s Nelson Street is to move on site in March 2014. The £1m scheme designed by Makespace Architects (London) will entail construction of a two storey extension to the front of an existing warehouse and will accommodate up to 800 people. An estimated 4,000 Muslims live within the city and surrounding shire. 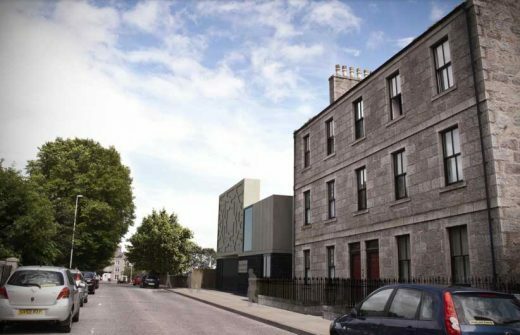 This is a city of great character and we can see that the Aberdeen community is going to make this an exemplary project. 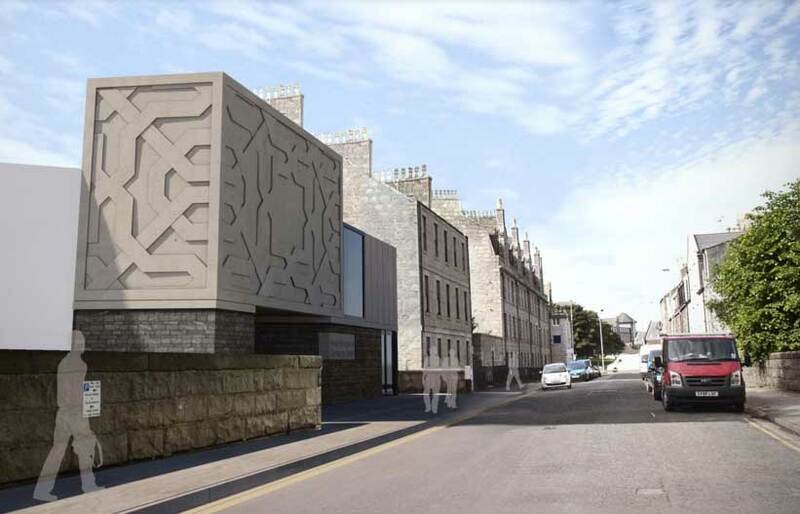 The city centre mosque is to be formed through the conversion of an existing warehouse, combined with a new build 2 storey front element creating a new street frontage. The building is designed to hold a capacity of between 800 and 1000 worshippers, and will also accommodate community services and activities. Aberdeen has a large cosmopolitan Muslim population, many employed in the oil industry or studying at the city’s universities. Our design approach is based on our vision of Britain’s Muslim communities as progressive and creative members of society and we want the building to reflect this spirit. Therefore we do not simply want to import Muslim architecture from other countries, and from other periods, without thinking about it. 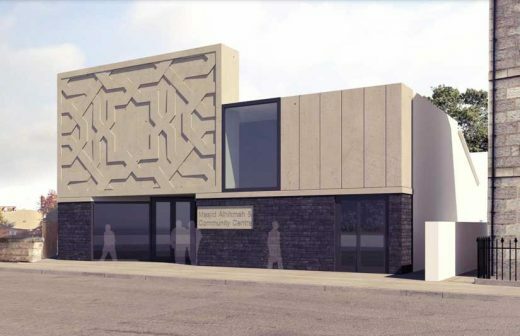 We want the new mosque to be part of contemporary Britain, and this is reflected in its styling as a piece of contemporary British architecture. Britain’s diversity brings new cultures, new histories and new ways of seeing the world. Muslim communities are part of this new diversity, and they bring a rich history and tradition to share. We want this cultural heritage to be reflected in the building, and have therefore combined the contemporary architecture with traces of an Islamic architectural past. We are also aware that the building should belong to its place, and we achieve this through its materials, local stone and modern cladding are combined to reflect the surroundings and embed the building into the city. In this way, the new Aberdeen mosque speaks of being fully Scottish, fully British, and fully Muslim all at the same time. It is a new architectural approach that combines and balances local architectural style and tradition with that from the rich cultural heritage of Islam. In this way we hope the new mosque represents and reflects the spirit of Aberdeen’s diverse communities, and serves as symbol around which understanding and interaction can happen. Elegant Scottish arts buildings with beautiful atrium and a strong collection of art.